Maybe you’ve read a little about the chakra system, but you’re not sure what it has to do with your life. Here’s why anyone talks about chakras: Your energy body (and chakra system) is a reflection of the health and balance that is present in your life, spirit and in your body. When you have an imbalance that is present in your life, it shows in your chakras. Intuitives read the chakra system because it’s a great indication of how you’re doing in the seven main areas, like: spiritual connection, material security, enjoyment and play, self-expression, emotional fulfillment, personal power and intuition. In some areas, you can be doing well and in other areas, you can lag behind. This results in imbalances in life. When you have a big imbalance, you can feel it. Something usually feels ‘off’ and you’re not fulfilled in the way you are when you’re in balance. – Working with higher powers to clear out your chakras. Who could benefit from listening to it? This is the next best thing to an intuitive healing session with me. This kit is also good for anyone who wants to learn part of the process professional intuitives use to tune into their clients’ Spirit Guides (i.e. opening and clearing out chakras.) What I haven’t mentioned before is that this is an adapted version of chapter five of my Intuitive Awakening course. Everything in that product is designed to move you along your path of intuitive development very quickly, this chapter included! How Does Learning to Open and Close your Chakras Help Your Intuitive Development? Thirdly, this kit would be good for anyone who wants to have the lifelong skill of learning how to read their own chakra system for imbalances and take steps towards greater balance. You will learn how to recognize imbalances in your chakras and take practical, real-world steps to address them. I did not want this kit to be one of those courses where you feel great afterwards but then you forget all about it and never listen again. So, you get homework. This really is the next best thing to working with an energy healer and getting homework to improve and rebalance your life. A 45-minute guided audio meditation, set to relaxing music. A 5500 word e-book to go with it. There is also 47 minutes of audio instruction that you can listen to instead of reading the e-book, if you prefer. Please note that this is not a physical product. It comes in digital mp3 format, so you get it sent instantly to your email address when you order. 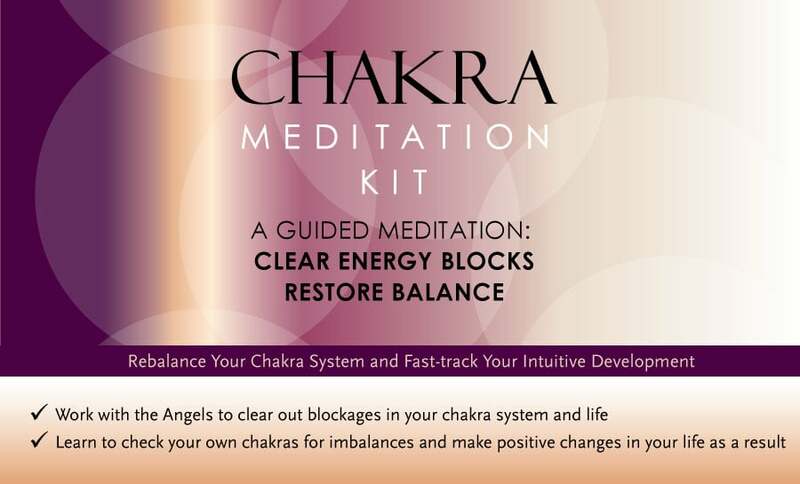 The Chakra Meditation audio kit costs $30 USD. How do I download the course files? We recommend that you download all files onto your computer. If you are using an iPhone, iPad or tablet, you can download the files using the latest versions of Chrome or Safari, and then send the files to your Dropbox app, Adobe Reader app (for PDFs) or Google Drive. You can also find numerous free apps that allow you to download files to your device. Or, you can first download the files to your computer, and then transfer/sync the files to your device. Please note that we aren’t able to offer tech support for downloading to your phone or tablet if you encounter any issues – only for computers. This is why we recommend you download the course via a computer.